When Bob was a young boy he met an amazing man by the name of Cecil. Cecil was a member of the First Nations and had chosen to live by himself in a small cabin in a protected area of a bay not far from the Graham family cottage on Sparrow Lake. Cecil would come by once or twice a summer for dinner and tell stories about his way of life, his adventures and his many animal friends. He passed on his beliefs about Mother Earth and gave a young Bob a vision of life that he has lived by, and now passes on to others with his Cecil Stories. 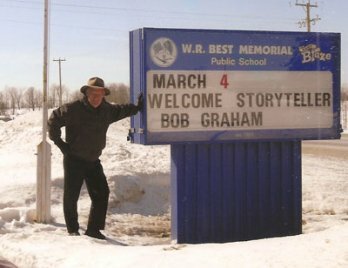 Bob has been telling these stories around campfires, at schools, libraries, vacation lodges/resorts, retirement homes, The Leacock Museum, The Mariposa Folk Festival, birthdays and even to audiences of one. Graduating from The University of Guelph in 1968 he received a Diploma in Agricultural Business. Bob spent his entire career in sales and marketing with the majority of this time running his own company. Now retired, Bob is busier than ever doing something he loves while living in Orillia. In the future Bob wishes to pursue even more opportunities to story tell and he is very open to venues big or small. In doing corporate work Bob has found an appreciative audience for his laid back, soft tell approach. He likes to say, "It is not so much the story that a person remembers. It is how the storyteller made them feel when they reflect back to what they heard and their time spent listening." It brings a sense of calmness and appreciation into their lives. Letting a person reflect and dream allows them see where they want to be in life and how best to work towards not only their goals, but the goals of those they work for and with. It really is a different approach and leads to tremendous results. Please call or email with your enquiries and let Bob put a presentation in front of you for your consideration.